After booking our first music festival since having children we started to look for ways in which we could transport Jesse around the festival site. There were plenty of ready-made kids wagons out there already. Radio Flyer certainly has the American monopoly and because they are pretty rare with retailers on this side of the Atlantic they tend to demand mega money and the range that you can get hold of is often limited. We looked at others too, but issues such as size, material, and available colours meant we were never truly happy. It was time to make our own festival wagon. I had stumbled across a festival wagon rentals firm online that works the festival circuit. They charged a pretty penny to hire their garden trolleys out either on a day-by-day basis or for the full duration of the festival. Don’t get me wrong, this was a fantastic option for parents who have limited space to transport a wagon in their vehicle. However, these wagons seemed little more than a base unit that would offer little in the way of real comfort, protection or style and I struggled to see the value of them. For instance, a showerproof cover is great if the rain is light and only lasts an hour. What would you do in the event of a traditional festival downpour though? I wanted something far more substantial. Reading Amazon review after Amazon review finally led me to the TecTake heavy duty garden trolley (£60). Capable of carrying 770lbs/350kg it could take the weight of our entire family plus dog and then some. The reviews were excellent so I ordered it. I was pretty sure that if it could handle 350kg of mud and rubble, it would form the basis of an excellent festival wagon. Now, I am somewhat of a Lego fiend. Give me any combination of parts and a set of build instructions and I’m like a pig in muck. What arrived with the trolley though could never, in anybody’s language, constitute a set of instructions. Factor in to this that my expert level Lego building skills never really transferred themselves into real, useful handyman-type attributes and I was already looking like I’d bitten off more than I could chew. I am, and always will be, a DIY disaster. So, after loaning a socket set from my father-in-law I set off with the considerable help of YouTube – the DIY failure’s digital friend. It seems that so bad were the instructions that people had been compelled to help their fellow human beings out by creating their own video guides. On completing the initial build I then painted the base unit in a more child friendly red using Hammerite outdoor metal paint which instantly made it look better and would further protect it from the environmental battering that would surely come its way. I then visited my local Wickes store (very much a first for me) to obtain some plastic plumbing pipe and brackets that I could use for the removable canopy frame. These worked a treat as they were cheap, lightweight and, most importantly, strong. Using a hacksaw (another first) to cut them to size, I then drilled three holes along the top and bottom of each side panel to fix each of the brackets to, which were then finished off with rounded bolts so that there were no sharp edges protruding to catch little legs. This was particularly necessary as I’d had to cut the screws to size. The final stage of the festival wagon build was to decide on a theme. After a long and drawn out creative consultation with Jesse we decided on space. I got a good friend of mine who is an artist (the highly recommended Bongoart / @scottbongos71) to design the sideboards based on some ideas that I’d emailed across to him. Once he’d worked his magic I emailed the designs across to www.printed.com and had them transferred onto made-to-measure 4mm Correx display board. This is the same stuff that estate agent ‘For Sale’ signs are made out of so I was confident that they would stand up to the elements and not add any unnecessary weight to the wagon. We then bought some lovely space-related material online to make the cushion covers with. At this point I was calling in favours at a rate of knots. After buying the foam for the inner cushions from Dunelm (again, only a few quid each) a friend of my mum’s offered to do all of the sewing – something no number of YouTube videos could have helped me with! We bought 1″ thick foam for the side cushions and 2″ thick foam for the base which we stuck to a 5mm piece of plywood using wood glue to give it some stability. Whereas we used the space material for the side cushions, I opted for navy blue fleece material to cover the base just to offer a little more comfort, insulation and that all important plush feel. All of them, however, were sewn to include velcro fastenings so in the event of the inevitable festival ice cream spill they could easily be removed from the foam cushion for washing/cleaning. Lastly I ordered the blue waterproof ripstop nylon that would be used the make the canopy from www.profabrics.co.uk . I opted for the slightly more expensive type – the type used in waterproof (note: not showerproof) jackets to provide the best possible protection from the wind and rain. My sewing guru managed to cut it to size and created three channels that were used to feed the plastic frame piping through. And, as each of the pipes were not permanently fixed into their brackets, this enabled us to fit and remove the canopy in a matter of minutes – perfect for a quick rain storm. A true convertable/cabriolet if ever there was one! Furthermore, as the pipe was very pliable, while it wasn’t being used it easily fitted inside the wagon itself, bending itself around the edges, allowing Jesse to sit on the base seat without taking up any room at all. To top it off we then fitted it with fairy lights so that it was easily spotted at the festival during the evening when lots of people would be moving around it. Plus, let’s face it: who doesn’t want to pimp their festival wagon! Jesse loved it and, much to our surprise, even took his nap and fell asleep in it during the evening which was a real bonus. We went there with the open mind that we probably wouldn’t see very much of the headline acts. As it was, once he had his baby ear defenders in place and was tucked up inside his cosy wagon (roof now up of course) he slept like a…baby, and we were able to relax knowing he was happy and watch every single one of the headliners. Amazing result! 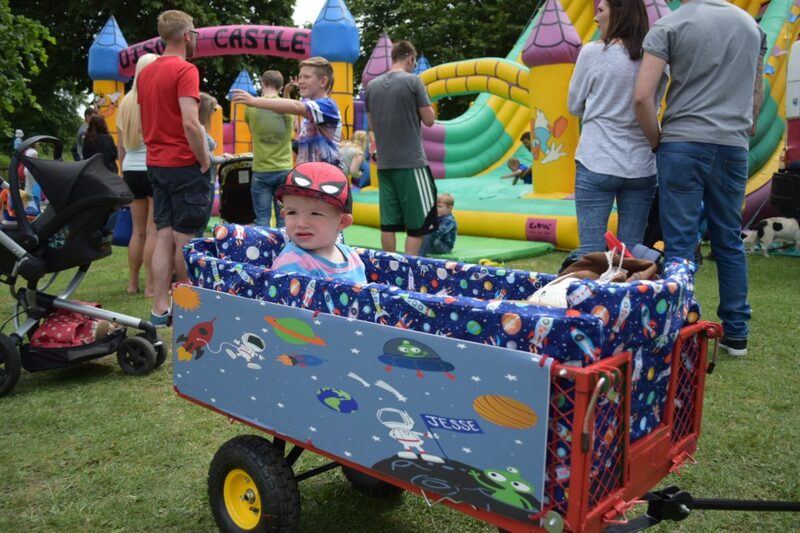 The other advantage of it was that by removing the canopy and metal sidewalls we now had a festival wagon capable of carrying 350kgs, which made transporting camping equipment, particularly at the festival, a relative breeze. We just took a bunch of bungee ropes to secure everything onboard. Although we had no problems whatsoever, I still took with us a socket wrench and puncture kit that I just left in the car just in case. My only problem now is will it fit two? Thanks Sarah, and yes upcycling is very cool. Let me know if you’ve posted any upcycled kids/outdoors stuff I’d love to take a look and pinch ideas. Ah thanks glad you like it. How was the Big Feastival? I like the sound of that. Food and music – what’s not to love! Ah thanks very much. The little one love it. This is amazing! You’re so talented! It looks very cool and very comfortable too! Thank you very much. Yeah the little one love it. Thanks Becky. And yes, if only everything came with Lego instructions! Thanks so much. Great linky, I’ll hook up as often as I can. Ah thanks so much. With my less than good DIY skills it wasn’t a quick process but so happy with the result. Thanks for reading and thanks for hosting I’ll certainly link up again. Wow, thank you so much. Thanks for hosting too we’ll certainly link up again soon. I’m not a festival goer (not into music) but if I was your invention looks amazing! I’ll have to show my brother for when he has kids ha ha. We’ve got a whole ‘taking kids to festivals ‘ section on the website that might be useful. In terms of a family tent we love our bell tent but they’re not lightweight for festivals. 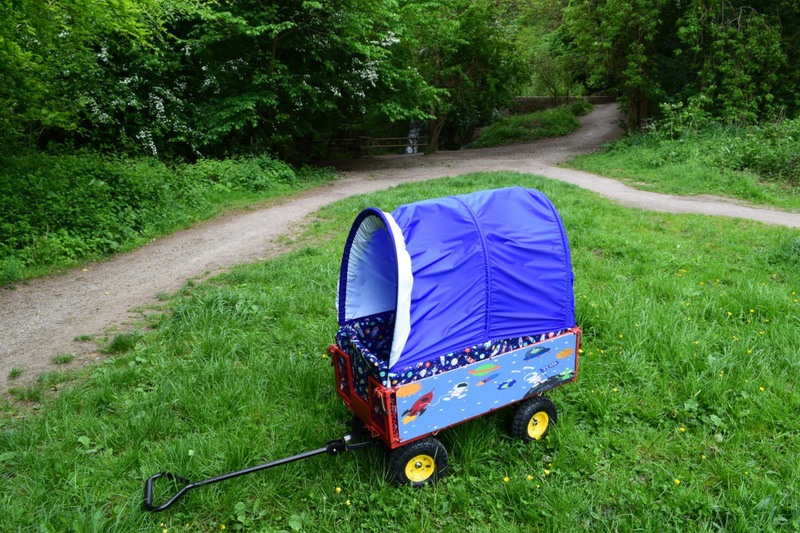 This is great I have been looking for some ideas on how to make my festiVal wagon, as broke my tent poles trying to use them! Going to buy the plumbing poles! Thanks! Ah glad it’s been useful. Let me know how you get on. This is fantastic! I’m doing a similar sort of ‘pimping’ to your wagon and wondered if you sanded the metalwork on the cart before respraying? No I didn’t Ally, but probably would next time and then just use a metal paint primer as a first layer. That said our paint has stayed on really well bar the odd scratch etc. Hope that helps. Thank you so much for your reply! My project starts today in time for the Big Feastival! Hi there, this looks so great… interested in whether the cart can be disassembled at all to fit in the boot of an estate car? Hi Sarah, yes we have an estate car. We just remove the handle and sides (this takes literally 2 mins) and they then all lie flat and everything goes in with room to spare. Hope that helps. You’re creative and talents. Really good toy build. How much material did you need for the cover? How long were the plumbing pipes? Was this enough head room for your son? It looks amazing by the way, do you still use it? What size was this trolley please?